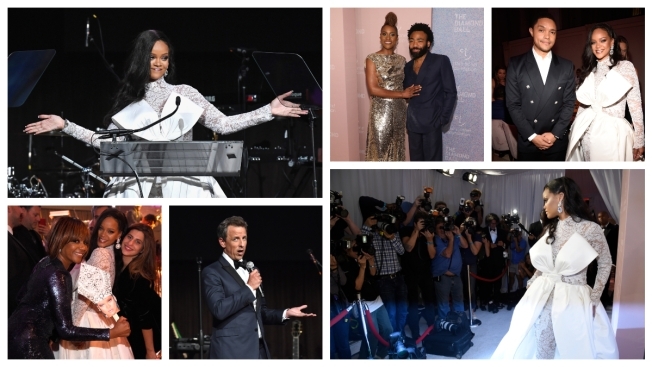 Issa Rae, Donald Glover, Trevor Noah, Tiffany Haddish and Seth Meyers were among the attendees and performers. Rihanna's Diamond Ball shined in its fourth year and continued to make a name as one of the industry's white-hot and must-attend parties — all while raising money for charity. Haddish watched Gambino, who performed "This Is America," ''3005" and more songs, like a die-hard fan right in front of the stage, even yelling her catch phrase — "she ready" — while the Emmy-winning "Atlanta" actor performed his Grammy-winning soul anthem, "Redbone." The Clara Lionel Foundation, which has supported those affected by Hurricanes Harvey and Maria, has set a goal to raise $25 million for an emergency response fund by next year's Diamond Ball. The organization also has a scholarship fund as well as oncology and nuclear medicine in Barbados, where Rihanna was born and raised.